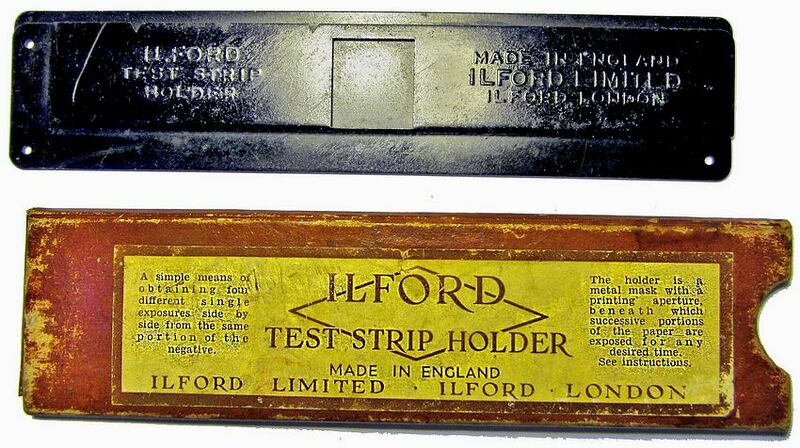 The Ilford Test Strip Holder was a device intended to assist with determining the optimum printing time exposure to use when making an enlargement. It consists of two pieces of metal strip, secured together but separated sufficiently for a an off-cut piece of enlarging paper to be inserted, its light sensitive side showing through the opening at the centre of the holder. The length of the paper needs to be a slightly more than 4 times the length of the opening. The width of the paper needs to exceed the width of the sheath by a small amount, so that the paper can be slid along by an amount that can be judged using the notches in the side of the top metal piece. The light sensitive paper would be inserted into the holder using the darkroom safelight and placed on the enlarger baseboard at a position such that the cut-out window was exposed to an important p[art of the image. The enlarger light would then be turned on for, say, 5seconds. The enlarger light would then be turned off and the paper slid along one 'notch', bringing an unexposed section of paper into line with the holder's opening. With the holder still positioned at the same place on the enlarger baseboard, a second exposure could then be made, of, say, 10seconds. This process would then be repeated a further two times, giving a resulting test strip showing, after procesing, the same section of print, but with exposures of e.g. 5seconds, 10seconds, 20 seconds and 40seconds. Once fixed and given a brief wash, the test strip could be examined in white light and the exposure for a complete print judged from the results of the test strip. 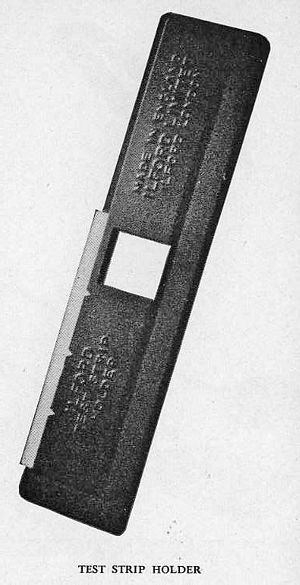 "Consists of a metal sheath into which a strip of sensitised paper is inserted. The aperture is then positioned to the portion of the image for which exposure information is required, and the first exposure is given. The strip of paper is then moved along for an arranged distance, and in this way a series of "stepped" exposures can be made. The strip of paper is then developed and inspected in white light, when the correct exposure can be decided." The image below has been provided by Tony Pritchard.